Bob Blazewicz Provides Professional GD&T Training Services Worldwide and Has Excellent References Due to His HIGHLY EFFECTIVE Training Techniques. Your instructor, Bob Blazewicz has over 25 years of industry experience using geometric dimensioning and tolerancing in mechanical design, supervision, inspection, project engineering and training. This experience has provided him with in-depth knowledge of all aspects of the design/manufacturing industry. In the last 20 years, he has trained thousands of personnel from the aerospace and automotive sectors across Canada, US and Mexico. Bob teaches GD&T with a real passion for the subject, and that is clearly projected to the participants. What makes this instructor unique is his ability to explain and demonstrate the GD&T principles in an easy to understand manner. Bob uses simple English in all of his explanations, relating directly to his audience due to his work background. Bob’s methods are creative, fresh and up-to-date, allowing participants to retain most of the knowledge they gained during the course. Bob approaches GD&T in a logical fashion such that participants learn to understand the complete GD&T system rather than simply knowing how to read each feature control frame. We urge you to do the right thing for your company. Contact us to arrange a training course and eliminate the frustrations of incorrect interpretations. Obtain the tools to effectively discuss all aspects of GD&T with customers, suppliers and fellow employees. Bob Blazewicz of 2B-Quality was contracted to teach a course on basic Geometric Dimensioning and Tolerancing from the ASME Y14.5-1994 Standard to a group of JLG Engineering Team members. The four day, twenty-four hour course was taught in January 2002 and was well received by our Team members. Over the last 6 months Bob Blazewicz was contracted to provide in-house training Geometric Dimensioning and Tolerancing according to ASME Y14.5-1994. Six separate classes have been taught that were attended by over 100 people. Although for years we had been using GD&T, we quickly found that the expertise that Bob brought to the class, gave us an enormous advantage. We wanted to take this opportunity to thank you for instructing and leading our group through the Geometric Dimensioning & Tolerancing course we completed earlier this month. It was a pleasure to have you teach the course, and all of our participants learned a great deal about the fundamentals and principles of GD&T. 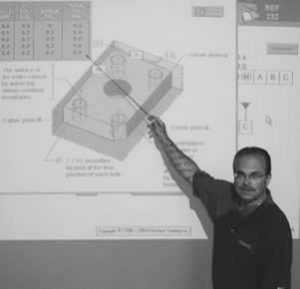 Bob Blazewicz delivered a four day training class on Geometric Dimensioning and Tolerancing to 12 Behr America Engineering employees in March/April 2003. We were extremely pleased with the quality of his instruction and would recommend his services as a trainer. First let me say that it was a pleasure having 2B Quality to our campus to provide our first training session on Geometric Dimensioning and Tolerancing. All of the participants found the session to be very informative and “real world” in presentation and discussion. Bob Blazewicz was in charge of teaching the GD&T course to many of the engineering quality, and production members at RB&W. Through personal experience of going through many training courses, I would say Bob was one who did an excellent job in describing key concepts informatively to ensure all trainees walk away with a clear understanding of GD&T. Give Bob a call and you will quickly recognize how much he can help your company.